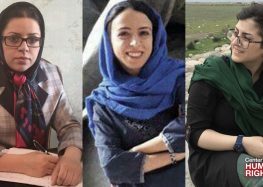 Women’s rights activists Hoda Amid and Najmeh Vahedi were arrested by the Islamic Revolutionary Guard Corps (IRGC) Intelligence Organization in Tehran on September 1, 2018 and taken to an unknown location, the Center for Human Rights in Iran (CHRI) has learned. Their arrest took place at their homes three days before they were scheduled to host a workshop about Iran’s marriage laws, a source close to the case said in an interview with CHRI. According to the laws of the Islamic Republic of Iran, women do not have rights equal to men regarding the right to initiate divorce, and they can only initiate divorce under certain circumstances such as the husband’s mental incapacity or drug addiction.